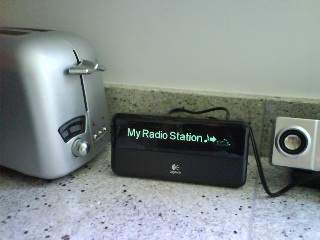 Last.fm – the Blog · Last.fm radio – now in a kitchen / bedroom / living room near you! Last.fm radio – now in a kitchen / bedroom / living room near you! What a brilliant little device… want one. I love how last.fm just keeps innovating. This looks great, and I’m definitely tempted to pick one up. How exactly does it work? Can you use it to listen to your last.fm playlists / tag stations / loved tracks? How does this tiny little box know who you are? I guess you have to connect it to a PC. In that way you can configure it through your PC with some program. Is this really news? The Squeezebox has been doing this unofficially for a long time using the squeezescrobbler plugin. Furthermore it scrobbles the music it plays. But the Squeezebox is simply a must-have for every music loving creature on earth. Find out why at http://www.slimdevices.com/ – but beware: Most people fall in love instantly. Now bring us the last fm radio service in Belgium! Wow, this is awsome. That’s what I’ve been hoping for! I found a way to plug my laptop into the sound system in the living room, but its quite a hussle. That thing looks really easy to use. can anyone tell if the Squeezebox Controller will show the artwork and/or artist pics of last.fm streams? @mbeveridge is bang on about setting it up: you add your Last.fm account information at www.squeezenetwork.com, and then once your account is set up you don’t need the computer any more to get Last.fm radio through your Squeezebox. You also don’t need the SlimScrobbler plug-in any more to scrobble tracks, the support for that is built in to the official Logitech software. i hope you make some good scrobbling and radio-playing software for the iPhone and iPod touch, now that the ‘legal’ apps are nearer! If you’re into last.fm, I guarantee you you will love a Squeezebox. Does it play personal tag stations too? Where is logitech support for my awesome G15 Keyboard? No squeezebox for Canada? You must be very sorry. So, this is going to be like that “Free the music” initiative, where you say that it’s going to be extended to other areas beside UK,US,Germany, but never is? When are full length tracks coming to other areas? This makes me wish I had an apartment big enough that one of these would be of any use to me! and, what about more generic support ? If you tell me the URL of my stream, then we can set it up on any device (especially Sonus…). Wow! This great idea and product: Squeezebox. That’s very nice, but I have been the owner of a Squeezebox for more than a year (this box really is a great device), and it has always been possible thanks to plugins. But that’s a good thing that is now included in the official software release of Logitech. By the way, when do you expand “Free the music” to other countries, especially Switzerland ? Please expannd it to Switzerland soon! @ longfield – i’m pretty sure this means that now you can play your own personal radio, playlists, tag radio, etc. (along with scrobbling of course). correct me if i’m wrong but i don’t believe those were available before except for just scrobbling. Can you add scrobbling and last.fm station playback for my Revo Pico as well?